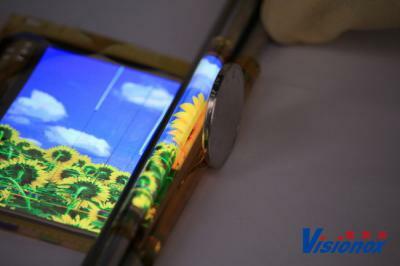 Visionox unveiled a new rollable flexible AMOLED panel prototype. This is a 4.6" panel with a resolution of 800x480. This display has a curvature radius of less than 3 mm and a thickness of only 20 μm. Visionox says that they plan to mass producing such displays within two years. Looking at the video above, it's clear that there are still defects in this display, so it will take some work to achieve mass production of such a display. Visionox recently started to mass produce the company's first AMOLED panel, a 5.5" display aimed towards the mid/high smartphone market. While the company did not reveal any technical specifications, it's likely that this is a Full-HD panel. Visionox's Gen-5.5 AMOLED line can currently produce 4,000 monthly substrate, and once yields stabilize they will reach a full capacity of 15,000 monthly substrates.